Musical performances will be taking place all throughout the city today (Friday, June 21) as part of the inaugural MakeMusicMadison event. The free festival brings together 284 performances at 110 different locations throughout the city. The MakeMusicMadison event is part of the international World Music Day event in cities throughout the world. The matchmaking software powering the festival was developed by a collaborative team in Madison, and is powering other World Music Day events around the world in cities including New York, Philadelphia, Denver, and Athens, Greece. A full listing of performances and a venue map is available here. Nextt has completed a $700,000 seed funding round lead by Venture Investors and Great Oaks Venture Capital. Nextt is focusing on the “future of social” and is building a private social network that focuses on connecting friends around real-world events and experiences. The startup was founded by serial entrepreneur Mark McGuire (of NameProtect.com and Jellyfish.com), and was featured on VentureBeat in an exclusive interview about their funding round and product. Check out the full VentureBeat article here. The Capitol Neighborhoods, Inc (CNI) Annual Meeting will feature Alder Scott Resnick who will present his insights on the growth trends of Madisonâ€™s high-tech sector and its affect on the downtown in coming years. Resnick is the District 8 Alder and is also the Vice President at Hardin Design & Development. The CNI Annual Meeting will take place Thursday, June 27 from 7-9pm at the Monona Terrace. Madison ranked as the 5th Best City for High-Tech Jobs in a recent ranking from the Brookings Institution. The San Jose-Sunnyvale-Santa Clara region of California (Silicon Valley) came in at the top, and Madison came in at 5th between Seattle (4th) and Boston (6th) with 24% of the workforce in the STEM field. “The Hidden STEM Economy” report focused on jobs requiring a high level of knowledge in science, technology, engineering or math in the top 100 US metro areas. These jobs are often found in health care, computers and manufacturing. The report cited the University of Wisconsin as a top research institution and its hospitals and clinics, Epic Systems, and biotech companies as some of the primary contributors to the high level of STEM jobs in Madison. Check out the Madison specific infographic from the Brookings Institute here, view the full report here, and read coverage from MarketWatch here. Cellular Dynamics International (CDI) has filed papers with the SEC to hold an initial public stock offering which could allow them to raise up to $57M. CDI was founded by UW-Madison stem cell pioneer James Thomson in 2004, and makes induced pluripotent stem cell lines (iPS). The company has over 100 employees currently and sells their products primarily to major pharmaceutical companies such as Eli Lilly and AstraZeneca. Read more here. The Wisconsin Angel Network recently released their 2013 portfolio detailing investment activity in Wisconsin last year. Overall VC and Angel investment totaled $163M in 2012. Deal activity is up 7% from the previous year, which is a significantly higher increase than the national average of 1.8%. The investment activity was concentrated in the Madison and Milwaukee areas, with Madison area companies receiving 60% of the total investment dollars. Be sure to check out the full report here. Codiqa (aka Drifty Co) was rated as one of the “100 AngelList Startups To Watch In 2013” by ReadWriteWeb. Codiqa ranked among the top “Design Startups” on the list. The list contained 9 different startup categories, and represents a powerful cross-section of todayâ€™s best technology startups. Drifty Co is a cloud based software company whose products include the mobile web and app prototyping builder Codiqa, and the Twitter Bootstrap interface builder Jetstrap. Check out the full list of 100 Startups here. 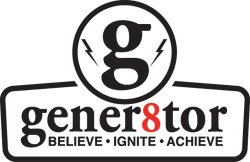 Dale Emmons, the Founder and CEO of Vidmaker, will be speaking at the Founders’ Series Meetup hosted by gener8tor in Madison on Wednesday, June 12 starting at 6pm. Vidmaker provides an online video editor that lets you work with video on any device, anywhere and with anyone. The company is a graduate of TechStars Cloud 2012. Dale currently serves as the CEO at Vidmaker, and prior to that Dale was a software engineer at Sony Creative Software in Madison. The Wisconsin hackerspace movement was recently featured on the 45 North with Anne Strainchamps radio show on Wisconsin Public Radio. 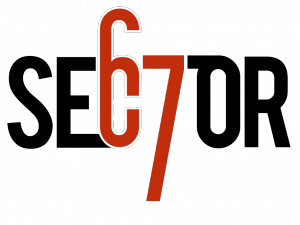 The segment included Chris Meyer of Madison’s Sector67 and James Carlson of Milwaukee’s Bucketworks. The hackerspace movement, as well as the background and some of the ongoing projects at the local spaces, were highlighted. There are now at least 300 functioning hackerspaces nationally, up from only around a dozen just 5 years ago. To listen to the full segment, go here. Fishidy recently announced that its fishing resources will be available in approximately 2,600 Walmart stores nationwide to help anglers of all kinds maximize their upcoming fishing outing. Fishidy is a network of anglers and fishing resources, and offers fishing maps of over 8,000 bodies of water nationwide. Through signage and a display interface found in the Outdoors section (viewable here), Walmart customers can use Fishidy to access maps, tips and fishing reports by zip code, as well as browse a checklist of recommended items to bring on their fishing outing. Fishidy was also recently featured in an article in the Wisconsin State Journal, which is available here. gener8tor just kicked off it’s Summer 2013 Program in Milwaukee. The 12 week program will provide 5 teams capital, mentorship, expertise, and more and will culminate with a Launch Day event on August 29 where each team will pitch their company to a crowd of community members and potential investors. OpenHomes (Madison, WI) – OpenHomes is a safe, affordable, modern way to buy or sell a home. OpenHomes uses technology to connect homebuyers and sellers as well as helping real estate agents serve their clients better and more efficiently. Catalyze.IO (Milwaukee, WI) – Catalyze.IO offers cloud-delivered backend infrastructure for health and wellness applications to make it easier, cheaper and faster for developers to create solutions for healthcare. DeckPresenter (Austin, TX) – DeckPresenter is a web presentation tool built for businesses designed to host, manage and track PowerPoint decks. Docalytics (Minneapolis, MN) – Docalytics builds online tools to help marketers get more from their content marketing activities. Optyn (Chicago, IL) – Optyn optimizes the marketing relationships between businesses and consumers. Want to help fix Madison’s BIGGEST problems? 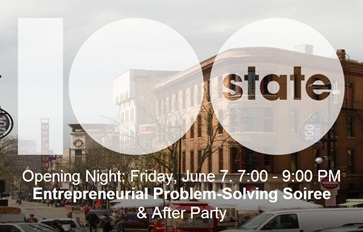 100state is a new co-working and community hub in downtown Madison that helps young professionals use their talent and passion to change the world and get paid for doing it. We have new space, great partners and growing membership… and you’re invited to come check us out! Applications are now being accepted for 100state’s opening night on the 7th of June. 2. You work in teams to come up with great ideas and solutions and get to know other entrepreneurs while having fun and working your magic together. 3. 20 minutes later, we switch you to a new problem with a new group, and repeat. Following the event, 100state will help you or others implement the best solutions that come up! We’ll have pizza from Ian’s at 7, refreshments and drinks throughout, and at 9 we’ll transition into a night of music and mingling. Know a problem you want discussed? Add it here. Entrepreneurs, creative professionals and others interested in contributing their skills and experience are invited to join. Admission is free, but space is limited to 100 for the Soiree so please RSVP to reserve a spot.